Americans love their festivals. Music festivals, film festivals, and even a good chowderfest in the middle of winter. But what about science and engineering? 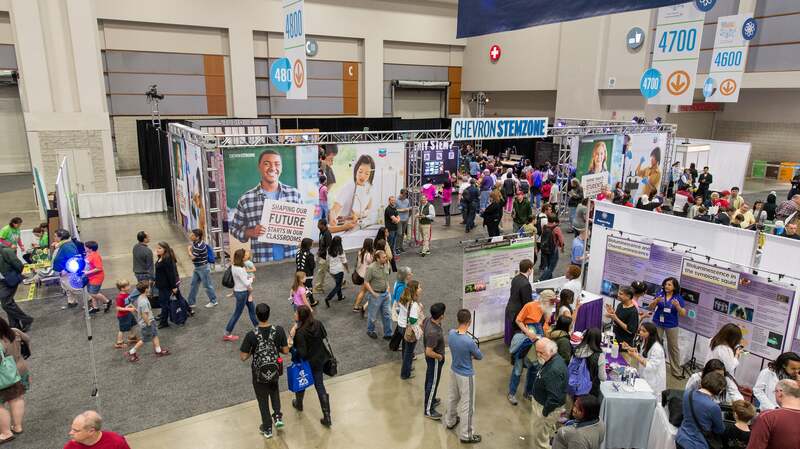 People might not think of academic subjects as being an obvious fit for a festive atmosphere, but the USA Science & Engineering Festival in Washington D.C. could change anyone’s mind. With over 3,000 exhibits and 30 live shows, past festivals have shown that more than 300,000 kids can see STEM from a new perspective in a single weekend. I had the chance to attend two years ago and can still remember the chaotic sound of thousands of kids getting see something they have never seen before. Thousands more will get that chance (for free!) at the 5th festival held at the Walter E. Washington Convention Center in Washington D.C. April 7th and 8th. Because STEM outreach activities are often expected to stand alone, many of them try to expand their approach and content to entice a broader crowd. Things are a bit different when you are one exhibit among thousands. Speaking from experience, I can say that festival exhibitors are given a pretty open challenge: hands-on, interesting, and able to handle a high volume. That means an exhibit can dive into its niche. Make it quick, make it cool, and serve as part of the collective mission to inspire. Attendees are then able to fan out and find something that appeals to them. There are live shows and chances to meet scientists. This year’s schedule mentions ASIMO the robot and an escape room. Not interested in space? Keep moving to get a thermal image taken of your own face. Not interested in Bernoulli’s principle? See if you can take a sample from a fake Martian surface with your arms in the sleeves of a space suit. It would probably be impossible for a single kid to see every exhibit, but that means it is also improbable that any kid (or parent) can make it through the hall without finding something to get excited about. The kids who make their way to the Festival floor aren’t just the kids who are already primed to like science – and the organizers know that. They are excited by it. Many of the activities are designed to highlight STEM concepts in areas that kids might otherwise not think of as particularly “science-y.” Booths might have activities related to sports, makeup, or photography. And attendees will get to learn from a range of volunteers – from scientists to fellow kids. The Techbridge Girls, an organization that has brought science programming to girls in high-needs schools for almost 20 years, will be bringing a group of their members not only to attend the Festival but to manage their own exhibit. Nikole Collins-Puri, CEO of Techbridge Girls, said that they are excited to bring some of the “secret sauces” for exciting STEM experiences that they have developed in their programs and share it with a new audience. Their first festival experience had more than 4,000 kids come to their booth. This year – with chances to make slime and craft your own lip balm from scratch – they are hoping to spark an interest in even more. The Techbridge Girls are just one of the non-profits coming to the Festival as part of Chevron’s STEMzone. Chevron is one of the major sponsors of the event, and Janet Auer – Global Social Investment Advisor at Chervon – said that they are excited to give kids a chance to teach their peers at the event. This year’s STEMzone will also have students from the IU1 FabLab helping attendees to find their inner maker. Auer said that she is most inspired when kids look at something familiar and end up saying, “Oh! I didn’t realize…” That is why the STEMzone will be featuring activities that feel familiar, like lip balm and slime, and provide a chance to think about them in a new way. People come in from all over the country to attend the Festival, but the special Sneak Peek Friday gives an extra chance to those nearby. The Sneak Peak is open to local schools, homeschool students, and military families. Festival organizers know that many local kids might not be able to make it to the convention center over the weekend, so students are bused in to have a first chance at the Festival before anyone else can go. Auer explained that Chevron was excited for the chance to sponsor the Sneak Peek. She said that their years of collaboration with the Festival make them want to provide that opportunity to as many kids as possible. After years of experience, she has the following advice for kids (and grown-ups) planning to attend: “Come ready to have fun, don’t be afraid to ask questions, and plan to be worn out.” Make the most of a day with 3,000 chances to be inspired.